The eMate 300 was released in the midst of Apple's tumultuous economic period, with Gil Amelio at the helm, and little more than red ink flowing from the 'doomed' company. In an attempt to reach Apple's traditional base, a Newton for education was developed. The rugged eMate 300, designed for student use, was designed to take abuse that would make any PowerBook or MessagePad user scream in horror. It has a translucent shell to protect it from drops from desks, backpacks, etc. It also hides all the circuitry within the confines of the shell to prevent any dirt, food, drinks, or water from shorting out the machine. The keyboard has function keys on the top, which replace the button bar of the MessagePads. But probably the most appealing feature for its young demographic is the fact that it looks really cool. The eMate 300's translucent green shell allows light to shine through and appears to be almost organic. Curves are everywhere, even in the hinge of the screen. With its color and curves, the machine is impossible not to touch and feel. 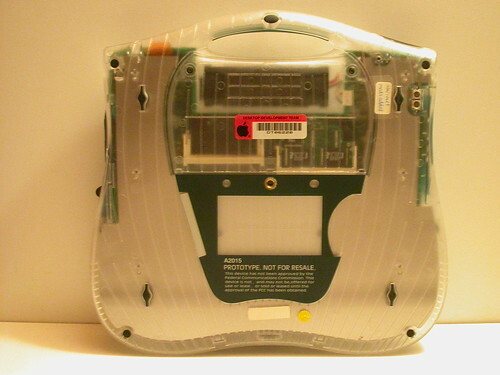 On the sides are the PC Card slot and serial and interconnect port. Unlike the MessagePad 2000, the eMate 300 has only one PC Card slot, and it is not CardBus compatible. Just ahead of the ports and slots are two holes that are used to hold the stylus upright when not in use. Waking up immediately when the lid is opened, the eMate automatically brings its word processing/drawing suite as the backdrop. Both apps are refined and easy to use, similar in functions to MacWrite and MacDraw. The apps are capable of printing and converting documents into Office and ClarisWorks formats for desktop editing. Waking up immediately after the lid is opened, the eMate already brings its word processing/drawing suite as the backdrop. Both apps are refined and easy to use, similar in functions to MacWrite and MacDraw. The apps are capable of printing and converting documents into Office and ClarisWorks formats for desktop editing. With a keyboard fitted for children's hands, the eMate was primarily marketed to primary education. Despite the smaller than average (think a little smaller than a Duo 230) keyboard, the machine is a good companion to any adult who needs to quickly take notes or type reports. The Newton OS was not designed with a keyboard in mind, but it is still useful, especially with its 'Close' and backlighting key that were not present on the earlier Newton Keyboard. Just as on all other Newtons, the eMate also includes the excellent handwriting recognition that made its debut with Newton OS 2.0. The display can be rotated 250 degrees to use the machine in slate mode for easier handwriting recognition, or for the odd application that requires Portrait mode enabled. When I am taking notes in lectures or reading books, I will rotate the display. to the side, and use the machine as a normal 'slate' with HWR disabled. The eMate includes all of the standard Newton software: Notes, Dates, Names, Calculator and various system utilities. Notes has an integrated outline mode that allows for rudimentary manipulation, and is compatible with Ink Text, allowing you to bypass handwriting recognition, and save a lot of time in the process. An ordinary mode devoid of topics is also available, also allowing for Ink text. With few distinguishing features, Dates and Names are fairly mundane PDA fare. A nifty feature in Dates is the Agenda view, similar to the Today screen of the Pocket PC, except the Agenda view allows users to change their schedule and to do list without launching the Dates application. At the push of a button, the eMate opens the Assist slip, a slip is a modal dialog box on the Newton. The Assist slip is a major time saver, allowing users to create new records through plain english. By opening the slip and typing "Meeting 3:30 w/ Rick", a new meeting will be created at the appropriate time with a link to Rick's name card, if he has one. Users can also use the graphing calculator, adding machine-style calculator, conversions utility, and fax send/receive that are all built in the eMate. Robust communications capabilities make the eMate an especially useful tool in a classroom setting. Students can share data and files they create on the eMate 300, with both Mac OS and Windows software based computers. By doing preliminary work on the eMate and then enhancing it on a desktop computer, students can use the eMate 300 as a perfect companion to the computers that already exist in the classroom or at home. The serial port, Newton InterConnect Port, and PC Card slot makes it easy to print, share, and backup any work done on the eMate 300. TCP/IP capabilities the protocol of the internet offers students access to materials on the internet, and let them send and receive e-mail so they can conduct research and keep on top of lessons. And with built-in infrared technology, the eMate lets educators and students "beam" their work to one another for quick, easy file sharing. The eMate offers many compelling features not found on other platforms. I recommend it, but only to those who know its limitations. Users will be hard pressed to find packages for some categories, and very few commercial vendors are still developing for the Newton. To sync with a machine without a serial port, the machine either requires a serial adapter, or ethernet card for the eMate. The eMate is very slow compared to modern PDA's. Do not expect to play MP3's while you surf the net. Despite the machines limitations, it is an ideal set up for students unwilling to subject expensive notebooks to the abuses of backpacks and friends, while allowing users to type pages of text, or jot down quick notes The eMate will last for years with reasonable care, and will offer portability unmatched in consumer notebooks, with its 20+ hour battery life. The eMate is an exquisite machine that I love dearly. Permalink Submitted by ravuya on September 14, 2004 - 2:43pm. I'm a big fan of this machine. It is really all most people need in a portable computer; I could see a "grown up" version of this, even with the monochrome screen, competing quite favourably with the top-end PDAs (which incidentally appear to be getting closer and closer to the eMate's form factor, if not the quality of the OS). Permalink Submitted by Tom Owad on September 14, 2004 - 4:16pm. I find the keyboard too small and very uncomfortable to type on. Permalink Submitted by westieg3 on September 15, 2004 - 11:15pm. this looks like the origional ibook was designed after it. id get one but i have plenty of mac laptops already and im hoping to get an old powermac that i used as a kid back from my uncle. this seems great and id love to see apple bring back the messagepad in a new design. Permalink Submitted by TheUltimateMacUser on October 27, 2004 - 10:45am. in that case, you can donate/sell (preferably donate) yours to me. Permalink Submitted by aladds on March 14, 2005 - 1:46pm. this looks like the origional ibook was designed after it. Permalink Submitted by astro_rob on June 13, 2005 - 11:07am. If you look at the underside of an eMate, you'll notice that there is a threaded mount. Turns out that it is 1/4" standard, like you find on a camera tripod. Thanks to that little attachment point, you can turn your eMate and tripod into a portable lectern. Since I plan on using my eMate for taking notes when doing my stargazing, this is a perfect combination. Permalink Submitted by dankephoto on June 13, 2005 - 1:45pm. Interesting idea, but not necessarily a smart one. The 1/4-20 thread on the bottom was designed as a security point to allow the eMate to be locked down to a flat surface. While I haven't destructo tested an eMate attached to a small camera tripod platform, I'd wager it wouldn't take much of a tilting force to rip that threaded insert right from the bottom plastics. However I reckon it'd be pretty safe if one were to add a large-ish platform (I'd say minimally 2/3 the area of the eMate bottom, best if larger than bottom) firmly attached to the tripod head. The key would be to not use the eMate's threads to attach the larger platform to the tripod head. Permalink Submitted by astro_rob on June 22, 2005 - 3:54pm. Good point, Dan. My plan is to do just that, once a better tripod is had (this one actually holds my little copier lens telescope... but I digress). The stress factor immediately jumped out at me. Permalink Submitted by Diorama on September 1, 2005 - 3:58pm. I have connected my eMate to a tripod once for a bit of fun, and it is ok as long a you put it on a Camcorder tripod as this has a larger baseplate under the screw (And dont bash it around too much). Permalink Submitted by vantage point on September 1, 2005 - 5:49pm. How about some good astronomy apps for Classic Mac OS? Can you recommend some? Permalink Submitted by ILovemacs84 on September 21, 2006 - 6:13pm. hi, my name is nick i am new andwhat i use for astronomy the program gravitation. it is a simulator, you create the planets and the velocity for the planets. its easy to use and its good vector graphics. Permalink Submitted by TheAbbott on August 9, 2007 - 12:53pm. Permalink Submitted by eeun on August 9, 2007 - 1:15pm. Permalink Submitted by sonnyhung on September 12, 2008 - 10:38pm. To my personal knowledge I know of the existence of only two. This one (which is MINE all mine! )and the other (below) owned by Flash Sheridan. The third photo in the original post is actually of a Prototype with the production Green Case but a Grey Keyboard. Permalink Submitted by tmtomh on September 13, 2008 - 11:58am. Holy Crap! You really should start a new forum thread or story about this amazing prototype. 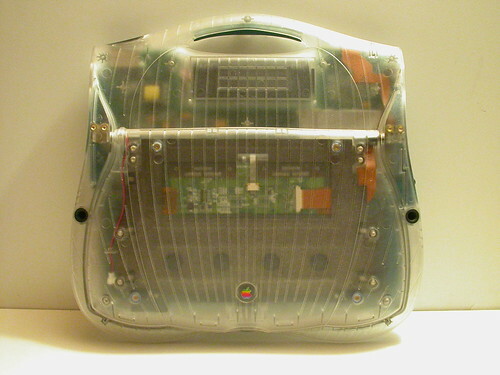 It's one of the coolest-looking transparent Apple prototypes I've seen. Permalink Submitted by iamdigitalman on December 28, 2009 - 6:10am. 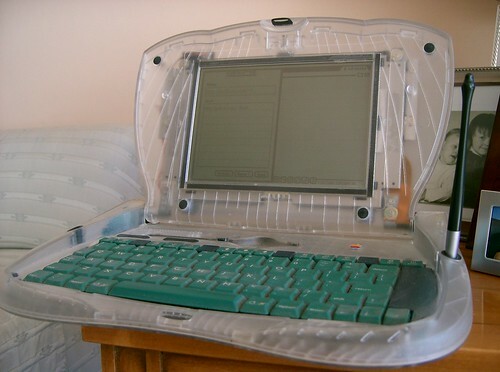 One of these clear eMate 300s was up on ebay for $5,000. The seller said there are only 5 in existence. With the other 2, this makes 3 with their locations known. It's a really cool looking machine, but the green keyboard looks out of place. I wish my emate still worked. I attempted the hinge repair, which was successful, but the cable was pinched in the jaws of one of the hinges, and upon removal, I damaged it, and the touchscreen is dead. The LCD still works though, and displays information. The bezel is also broken. Time to find a new one of these.